Despite geopolitical conflicts, the United States and the Russian Federation are still working together on space exploration, as this news item indicates. The station would be serviced by craft such as the Orion space vessel. 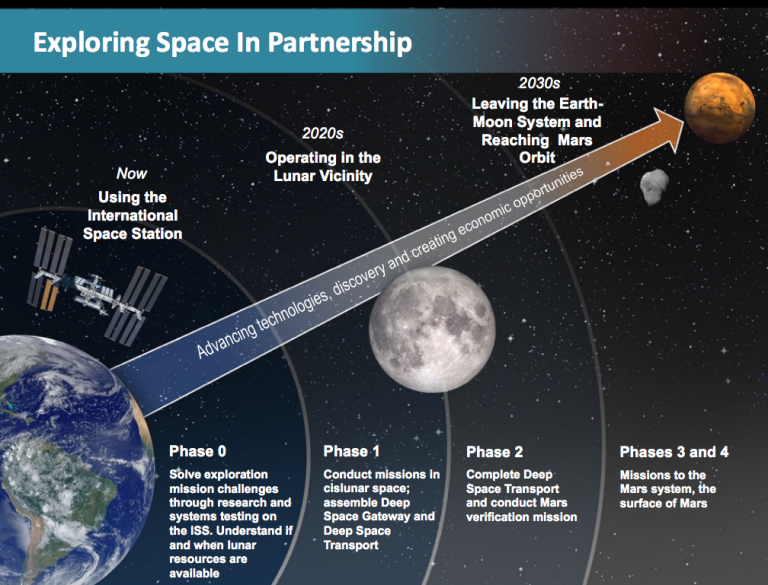 The US and Russia on Wednesday [Sept. 27] announced plans to cooperatively build the first lunar space station. Roscosmos and NASA, Russia and America’s space agencies, said they had signed a cooperation agreement at an astronautical congress in Adelaide. The agreement brings Russia onboard to the Deep Space Gateway project announced by NASA earlier this year, which aims to send humans to Mars via a lunar station. The proposed station would serve as a base for lunar exploration for humans and robots, and as a stopover for spacecraft. Roscosmos and NASA have already agreed on standards for a docking unit of the future station,” the Russian space agency said. The International Space Station is a joint project of the USA and Russia, and many of the spacecraft visits to the ISS are launched from the Russian-operated Baikonur Cosmodrome in Kazakhstan. I hope this new project bears fruit. It shows that the United States and the Russian Federation have more to gain through cooperation than ramping up a new Cold War. The following is a NASA press release. 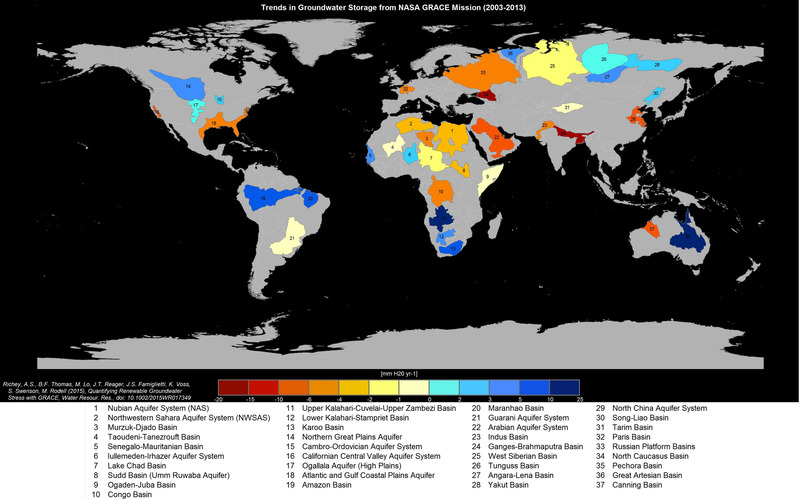 This means that significant segments of Earth’s population are consuming groundwater quickly without knowing when it might run out, the researchers conclude. The findings are published … in Water Resources Research. Hat tip to Bill Elwell. This video from NASA’s Scientific Visualization Studio is a simulation of the development of a typhoon off the coast of China during seven days in 2005. I could do without the corny musical score and sound effects, but I do agree with the video makers that the Earth, with its ecology of topsoil, waters, atmosphere and web of living organisms, is more like a living thing itself than it is like anything else. The Gaia hypothesis is a metaphor, not a fact, but it is a good metaphor. 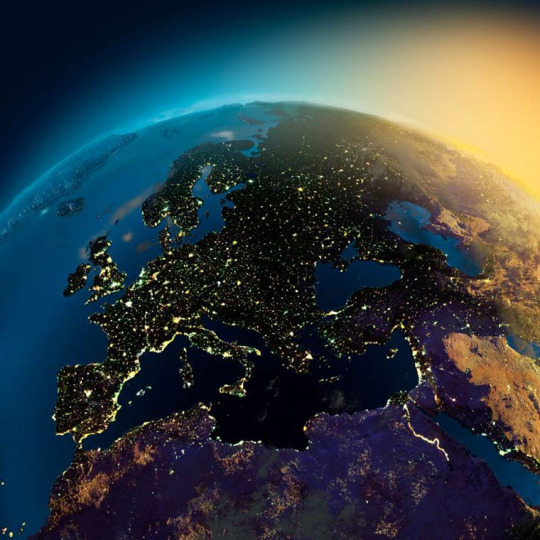 The Earth is more like a living thing than it is like an economic system subject to cost-benefit analysis, or a cybernetic feedback system that can be reprogrammed, or any of the other metaphors that blind us to our world’s inter-connectedness. The video shows three years of time lapse photos of the Sun, taken at the rate of two a day by NASA’s Solar Dynamics Observatory, at a time in the solar flare cycle when flare activity is at its height. In this video, the Sun looks like it is alive. But the apparent pulsation is due to variations in the position of the SDO as it orbits the Earth while the Earth orbits the Sun. Each of the flickers is a solar flare discharging orders of magnitude more energy than all the atomic bomb explosions in history. Click on NASA – Three Years of SDO Images for background. Night before last NASA’s Curiosity rover made a successful landing on Mars. It was a great achievement, one that makes me feel proud to be an American, and proud to be a human being. Here’s USA Today’s account of what was involved in making the landing a success. Curiosity, a roving laboratory the size of a compact car, landed right on target late Sunday after an eight-month, 352-million-mile journey. It parked its six wheels about four miles from its ultimate science destination — Mount Sharp, rising from the floor of Gale Crater near the equator. Extraordinary efforts were needed for the landing because the rover weighs one ton, and the thin Martian atmosphere offers little friction to slow down a spacecraft. Curiosity had to go from 13,000 mph to zero in seven minutes, unfurling a parachute, then firing rockets to brake. In a Hollywood-style finish, cables delicately lowered it to the ground at 2 mph. I can’t help but reflect that everybody involved did their jobs without the need for bonuses or other financial incentives. I wish that all American institutions reflected this level of dedication and competence. 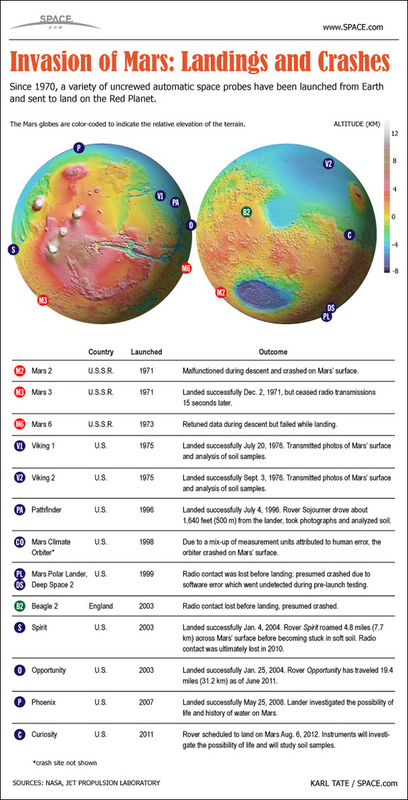 Click on Space and NASA News: Universe and Deep Space Information and NASA Mars Science Laboratory, the Next Mars Rover for more. Hat tip to Ken MacLeod’s The Early Days of a Better Nation for the video and graphic. Knowledge of the past is an antidote for discouragement with the present. When I stop and reflect, I realize that, on a day-to-day basis, the world was as threatening a place during the periods of history we consider great as they are now. We remember Periclean Athens not for imperialism and slavery, but for Sophocles and Socrates. We remember Elizabethan England not for its cruel executions and religious persecutions, but for Shakespeare. What about our own society will be remembered when Goldman Sachs and the “war on terror” are forgotten? Click on Contrary Brin for David Brin’s web log.